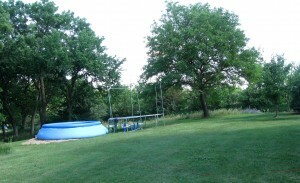 Apparently I have “anger issues” which surfaced (no pun intended) over a pool set up in our yard. It would help my cause here to say that I have a bad history with above ground pools and so it should be completely understandable that I tried to discourage Rose and Wayne from buying a large inflatable one (complete with a pump filter no less) for our family “enjoyment”. Since they were using their money to pay for it, I could hardly be that much of a spoil sport (oh, another issue I apparently have), and so the “fun” began. As you can tell from the photo above, our yard is not level, far from it. The logical solution was sand, brought in by a truckload. But (big surprise) it didn’t work, causing one side to collapse, creating a cascading waterfall that emptied the pool in 30 seconds with Rose going over the edge in a free fall, laughing hysterically. More sand, more leveling, more filling and thank goodness we’ve had enough rain this spring so the well shouldn’t run dry. When the pool was about a third full for the second attempt and seemed to still lilt to one side, I will admit to saying something to the effect of, “It’s not going to work, it never works, I hate pools, it’s just going to be another waste of money, and I can’t stand it!” However, the pool didn’t overflow this time and I did a very generous thing and said I was glad that I was wrong. I set out to a local hardware store that told me over the phone they had “everything” I would need. As it turned out, what they were missing was a person who knew more than I did about pool maintenance. The college-aged sales assistant and I discussed pH levels and what they meant for no less than 20 minutes before I asked if there was anyone else in the store who might know more about all this. “No one here would know more,” he assured me and finally managed to answer one question by getting on his smart phone. I came home with a bag full of stuff, including a huge plastic bin of white granules that would make my hard water more acidic, strips to test things I’ve never even heard of before, and something called a shock treatment. Helen said the only real solution was to drain the pool and refill it with fresh water and no one she knew had to use chemicals in their pool. Since I figured I might get in trouble for asking Rose to use chemicals from containers with large warning labels on them and Wayne was safely in his own home, I decided that, once again, this was on me. Eleven test strips, three treatments to lower the pH, and one shock treatment later, the pool started looking better. And now I have mixed feelings about all my protests about this pool. Why was I so against it? Why was I so ready to pronounce it a failure? And why did all those thoughts make me so angry? The day after all the treatment, I was admiring my recently blooming cone flowers when Rose came bounding up to me, a furry caterpillar in hand. She was heading for the door. “Don’t take that inside…he belongs outside…he’ll die….put him back,” I said before even thinking. “But Wayne said I could have him as a pet,” she so quickly replied. Ah…..and like the pool, I was outnumbered. 48 hours later, the pool still has clear water, though wouldn’t you know it’s gone from 98 to 82 degrees, making a dip seem less tempting. Mr. 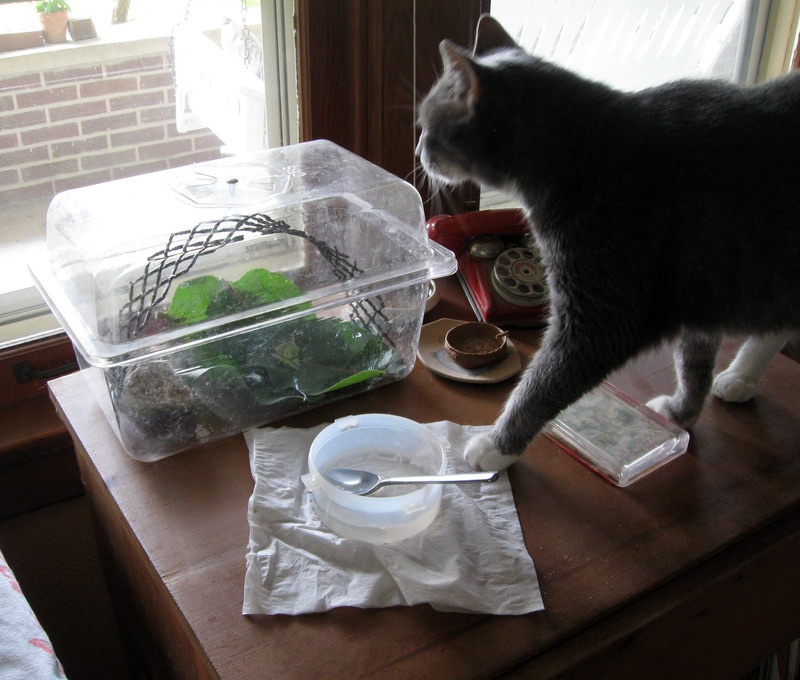 Fuzzy Wuzzy (or Ms. for all we know) seems fairly content in a plastic cage made just for the purpose of holding insects that Helen reminded Rose was in the attic. He has milkweed leaves (from our yard) and lettuce leaves (from the store) and drops of water. He’s left a trail of what looks like small mulberries that match the pictures on the internet of caterpillar poop. I have been told in a very stern tone that if “Mr. Fuzzy Wuzzy is sitting very still he may be ready to make a cocoon and you should LEAVE HIM ALONE.” And unlike the pool, none of this taking care of business has been mine. Well, except when Rose is in town and I have to check regularly and promise to call if there are any alarming events. As it turns out, checking on Mr. FW and the pool water has become rather enjoyable. I don’t want to be known by my children as having anger issues or being a spoils sport—at least not so often, as I believe there are times when anger and spoil sporting seem appropriate. But it would also appear that a little shock treatment can be helpful. It can clear the murky waters so we see what’s underneath. To see that there’s just a slightly dirty bottom and some grass clippings from when Helen mowed but mostly water clear enough to reflect the poles of the trampoline set nearby to use for a springboard. There’s just a caterpillar that might escape or even die (though not from neglect) but could turn into a butterfly. There’s just a late middle-aged mother who will need to keep using those test strips but who could spend a hot Kansas summer afternoon drinking ice tea (or whatever) with her children in a pool that, though set on uneven ground, seems stable enough for the time being. As usual, it was nice to know the end of your hardware store story. 😉 And, if you don’t know this already, you are one of the most patient moms that I know! Now, moving on to a different topic– a little bit of shock treatment to clear the murky water– there’s murky water that we would all like to see cleared–and shock treatment would be great! We had caterpillars once. Don’t assume they have died and won’t ever become butterflies. One of our decided to stay in the cocoon until February, which presents problems since you can’t release them out of doors. 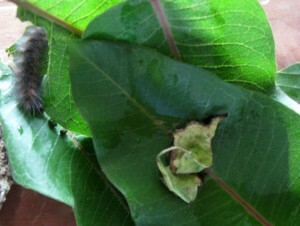 Luckily, they let us release him/her in the butterfly garden. Great images of leveling the site with sand, Rose surfing over the waterfall and the murkiness cured by shock treatment. Being in water is worth it all – I swim EVERY day – loving summer in NM, but you are making me miss KS! I noticed that your trampoline is also on unlevel ground. was there any issues with that? I think there’s no place in our yard that is completely level, but we haven’t had any problems with the trampoline. As long as it’s stable, it doesn’t seem to matter.